I would like to feel comfortable working with the blanket stitch on my sewing machine. 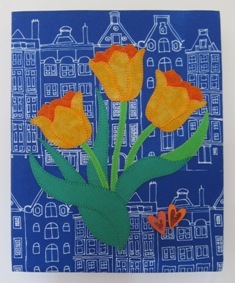 I have got an applique pattern of a bunch of Tulips that I think would be good for practicing the stitching. On a cold rainy day, while everyone was out watching a movie, I have made this applique on the background fabric from Linda Robertus's 'Dutch Houses' Range, and mounted it on a frame. I'm very happy with the outcome - and I love Tulips. :-) It has been a good exercise. I have gained the confidence and I'm now working on a quilt top with rounded shape appliques comfortably using the blanket stitch on my sewing machine.